Juggun Kazim has always been very open about her past experiences with people and about her abusive marriage which ended in a divorce. Recently she got married again and was blessed with another son. 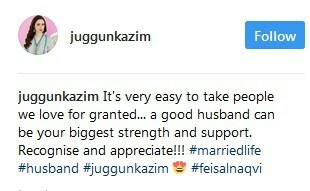 Juggun Kazim feels that some women take good men for granted and do not appreciate their spouses enough. It isn’t very often that women in the industry say something like this but we are not surprised that this came from none other than Juggun because she is always very honest and blunt.